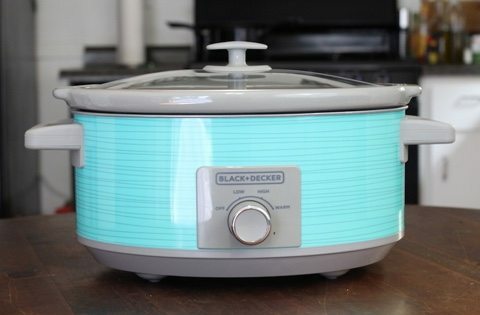 The 7-quart manual slow cooker from Crock-Pot is shockingly inexpensive for the size, and it's not much more expensive than the smaller versions they offer like the four quart cooker I reviewed recently. If you've used a slow cooker before, then you can pretty much guess what's available with the 7-Quart Oval Manual slow cooker from Crock Pot. This model (SCV700SS), has the standard warm, high, low, and off settings. The is glass, the crock is ceramic. Both are dishwasher safe, and the crock is oven safe (not in the broiler). The dial is very basic, but does click in place for each setting. I can't stand when dials do not have a click for each setting. 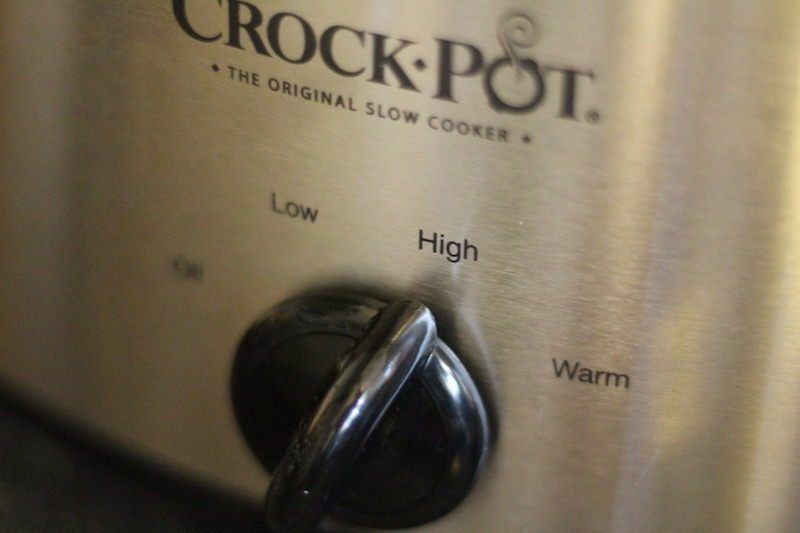 It's very hard to tell if your cooker is set to slow, medium slow, or high! Lastly, this is a very standard and basic stainless steel color. They also offer a red and black version. Color variations vary in price depending on when you buy. At the time of this writing, the black version is about ten dollars cheaper than the stainless steel model. Why? I dunno. Supply and demand I guess. Looking for extras? They aren't here! Seriously. 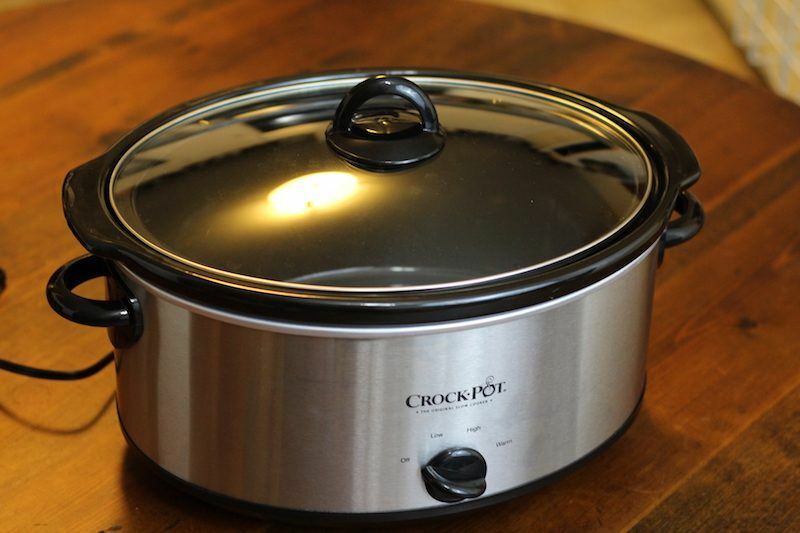 This is a very basic slow cooker. There's no timer, no locking lid, no rubber seal, no automatic warming…pretty much anything you can think of. But you get what you pay for, and that's a good thing in this case. 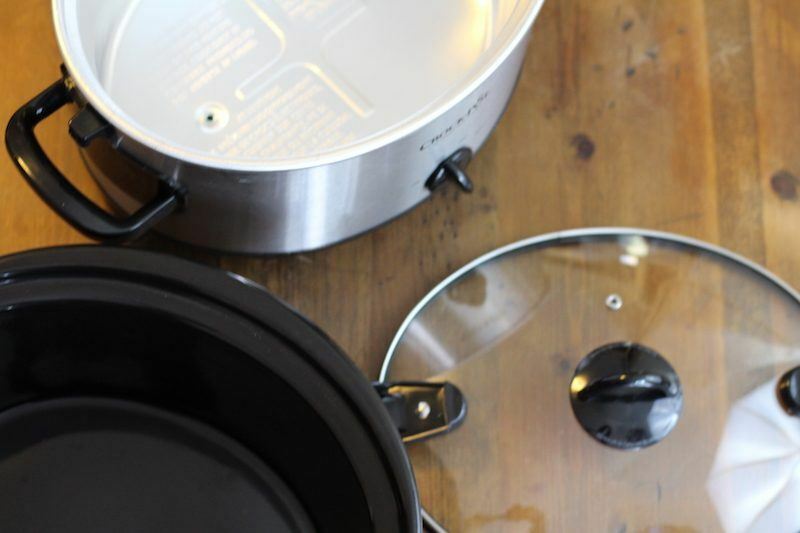 Although there are no extras, you still have exactly the same construction quality of even the most expensive Crock-Pot models, which are priced all the way up over a hundred dollars. 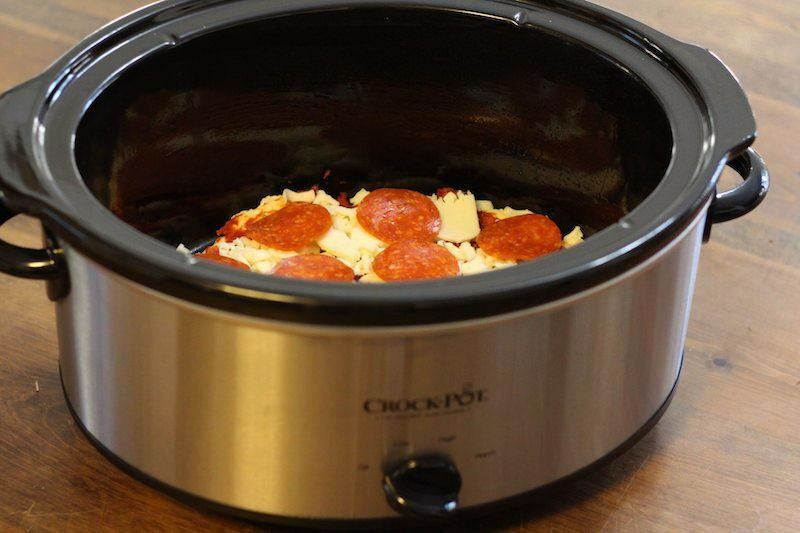 To test the Crock-Pot 7-Quart Oval Manual Slow Cooker for my review, I made a slow cooker pizza. It seemed easy enough. You buy the pre-made dough, put tomato paste, cheese, and pepperoni on top, and set the cooker to high for 2.5 hours. 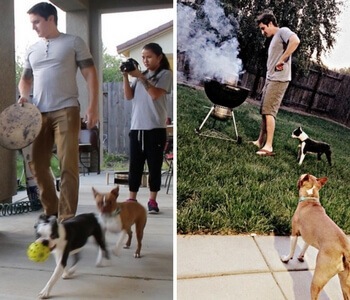 Unfortunately, things didn't go as planned. For one, the 7 quart cooker was too big for the dough I bought. I tried to get it evenly spread, but it would not lay flat in the cooker. After some squishing and using a beer bottle to roll it flat, I got it to pretty much fit the bottom of the cooker. After 2.5 hours, the dough was cooked on the edges, but soft in the middle. Another 2 hours later, it was starting to burn, and still wasn't 100% cooked in the middle. This was my first big recipe fail. Well, the pizza was still edible, but it's not a recipe I can recommend. I may have to tweak it, or do more research and cooking pizza dough in a slow cooker. I'm going to do another test for this cooker just to double check, but considering that the 4 and 6 quart versions went off without a hitch, I can't imagine the pizza fail was a result of the Crock-Pot. 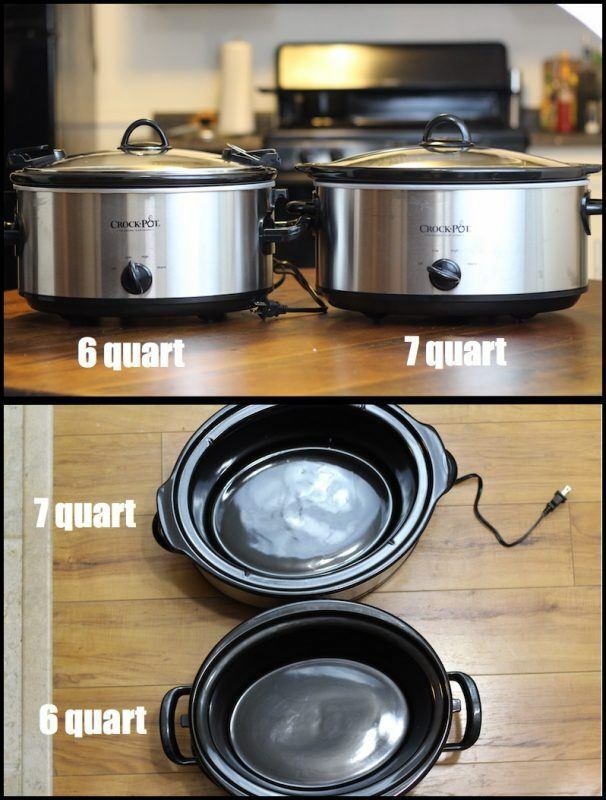 If you're looking at the 7-quart version of the manual Crock-Pot series, there are a few possible comparisons. One, do you want to get bigger, or smaller? Are you sure you want a 7 quart pot? This is quite large, and will feed up to 9 people depending on how much you eat and what type of recipes you make. A standard chicken will fit in a 6 quart crock. But if you want to make more stews and liquid-based things, the extra quart could help. Maybe you want to step it up to 8 quarts [LINK] and plan for extra. We've also reviewed a 6 quart manual Cook and Carry Crock-Pot, as well as a programmable version. Though model SCV700SS featured in this review does not fit into the Cook and Carry line, it's quite similar except for the carrying handles, lid handle, and dial design. Beyond that, you could check out the manual slow cookers from Hamilton Beach (six quart). We have not reviewed the 7 quart manual version, but will soon! There's also an 8 quart available as well. Personally, I tend to prefer the Crock-Pot brand. I like the designs better and they have more positive reviews on Amazon. In a world of so many choices…and there are TONS of choices for slow cookers…simple things like that can make a difference. 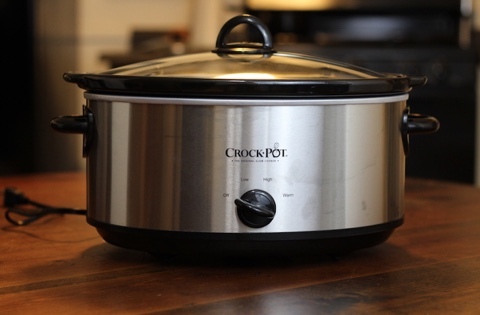 Who Is The Crock-Pot Model SCV700SS Best For? This is a rather large slow cooker, so it's best for someone with a couple of kids, or for a person that meal preps for the week. That can actually be very useful for saving time! Imagine setting your cooker to make 7 quarts of food on Saturday night, then packing everything Sunday morning. That's a weeks-worth of lunches done with just about 1 hour preparation. Though it may seem prudent to buy a large slow cooker just in case you have a party and the rest of the time you can just cook less inside the larger pot, this is not necessarily the case. If you do that, you may need to spend some time tweaking your recipes and cook time to get everything right. A large crock is meant to cook lots of food, so may cook a 4 quart meal too fast! 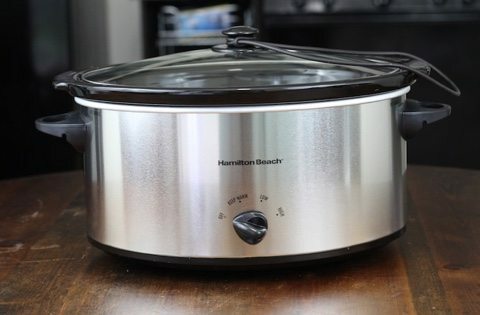 For more versatility, you'd need to look in the Hamilton Beach Right Size multi-quart slow cooker, which can cook 2, 4, or 6 quart meals in one crock. This is a very simple slow cooker, but it's perfect for making large amounts of food and saving time in the kitchen. If you're looking for a 7 quart slow cooker, this is the brand that we would buy. The one better option would be to get the 7-Quart Programmable Crock-Pot slow cooker [LINK] which we are testing and reviewing right now. That version would offer more versatility and freedom due to the digital timer and automatic warming.